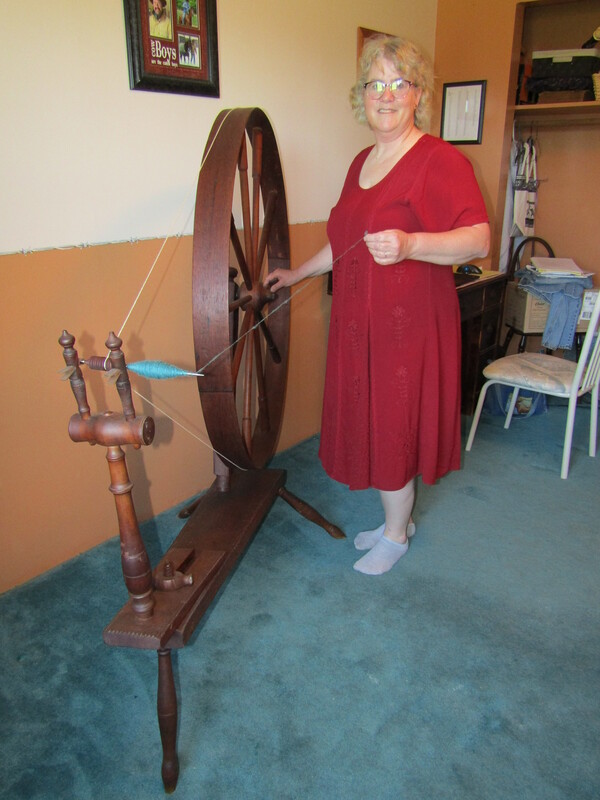 Pegg spinning on her 200-year-old spinning wheel. Pegg Thomas started knitting at age 9 in her local 4-H club. She has been spinning her own yarns since the tender age of 16 after she purchased a pair of English Angora rabbits to show in 4-H. From there she switched to French Angora rabbits and then to Border Leicester sheep. Drafting and Design captured Pegg’s interest in high school and she went on to study at Lake Superior State University. However, her love with design went into a direction she never imagined back in school. She started charting her own counted cross stitch designs. Published in numerous counted cross magazines throughout the 1980s and 1990s, when cross stitch started to slump in popularity, Pegg took her design skills and her love of knitting and started creating her own knitting patterns. Besides knitting and counted cross stitch, Pegg also enjoys quilting. With her antique sewing machines to piece the quilts and then hand quilting the layers, she doesn’t get too many made, but each one is a treasure.